One of the first things people used to see when they emigrated to these United States of America for decades was the gleaming statue in New York Harbor. What most people saw was the start of the new life. They were close to the truth, and millions of men and women have looked on that statue and been reminded of the costs of liberty and the responsibility we all share to ensure that it never dies from this Earth again. God who gave us life gave us liberty. And can the liberties of a nation be thought secure when we have removed their only firm basis, a conviction in the minds of the people that these liberties are a gift from God? That they are not to be violated but with His wrath? Indeed I tremble for my country when I reflect that God is just, and that His justice cannot sleep forever. Those words were penned by Thomas Jefferson, author of the Declaration of Independence, nearly two-hundred and fifty years ago. Today, according to The Hill, Senator Dianne Feinstein (D-California) will introduce a new assault weapons ban bill. I didn’t need to read much before I balked. The bill will exempt firearms used for hunting and will grandfather in guns and magazines owned before the law’s potential enactment. However, the grandfathered weapons will be logged in a national registry. Ready to cross that Rubicon Senator? If you read this blog, you are familiar, at least on a passing level, of the text of the Declaration of Independence. You are also likely familiar with history as it progressed from that point until now. I have written about the God-given rights espoused in that inspired document (Life, Liberty, and the Pursuit of Happiness), but I elected at that time not to dive into the “injuries and usurpations” part of the Declaration for a variety of reasons. I have been forced to rethink my own rationale for not tackling that subject in the past. I find myself compelled to write about the need to live a Christlike life, and yet I shrink from this confrontation because of how murky it can get as we muddle away from unconditional truth into areas made much more murky by politics and the less-than-unbiased lens of personal opinion. He has refused his Assent to Laws, the most wholesome and necessary for the public good. (Refusal to enforce Congressionally-passed federal law). He (and His administration) has obstructed the Administration of Justice (New Black Panther Party Voter Intimidation Case). Will enough eyes and minds be opened and realize these affronts to our founding? I do not know. Will people recall that the underpinnings of our founding were not intrusions and oppressions foisted on the American people by a foreign power, but by those that they called their own countrymen? Our history is replete with people recalling the greater of those past abuses and examples of tyranny, but few recall that while the British people and ourselves are different now, back then, we were all British (or Englishmen as it we would have been labeled at the time). What I do know is that the spirit of independence will not go out quietly… not everywhere. Darkness can drop on all of the world and yet the light of Truth will shine like a beacon in the darkness. The American spirit that binds us as countrymen, the one shared by patriots from Maine to California, from Minnesota to Texas, will not be extinguished by one man, ten men, or ten million men. Liberty will endure because it is from God, not men. It’s not that liberty is the easiest thing in the world to master. In fact, I would even assert that liberty itself directly opposes any attempt to impose a master, whether one man or a body of legislators and therein lies the deepest foundation of many of the political divisions that split our country. The God who gave us life gave us liberty at the same time; the hand of force may destroy, but cannot disjoin them. Give thanks as you enter the gates of his temple. The Lord is good. His faithful love continues forever. Much will be made in the coming few months of the will of the majority. (Expect much hay to be made about the Electoral College and the popular vote if Romney takes the most Electoral College votes, but comes away on the short side popularly). In Morality, I wrote about moral populism. I described it as mob rule at it’s core. Now imagine moral populists taking the reigns of government and enacting laws based on the mindset of “majority rules.” I went on to explain how the majority’s will does not make anything good, or morally right, it just makes it popular. As Christians, what should our stand be when faced with an unjust law? Should we tolerate it as mere temporal folly? Should we not speak up about the law if it does not effect us? If society deems evil to be good, should we do nothing? How much evil should be tolerated regardless of how popular? Where do you draw the line? If the culture deems evil to be acceptable and normal, how should we act? It even calls scripture to mind when it tries to force evil down your throat in the form of an unjust law by quoting scripture. Let the world threaten you with fines, penalties, ridicule, and shame. They will drag you through the mud and try to convince you of how wrong and regressive you are. They will try to minimize you with their attacks, but each one that you resist successfully will strengthen you against them. They may even try to imprison you. They may even try to kill you. Do not be conformed to this world, but be transformed by the renewing of your mind, that you may prove what is that good and acceptable and perfect will of God… Abhor what is evil. Cling to what is good. Friendship with the world is enmity to God. If sinners entice you, do not consent. Will you follow the unjust for the sake of keeping the peace on Earth? 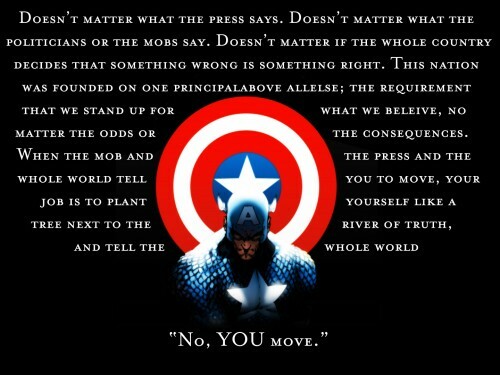 Just because the majority wills something does not make it right or just. To paraphrase St. Augustine, an unjust law is no law at all. I answer to the One above it all, not to men. 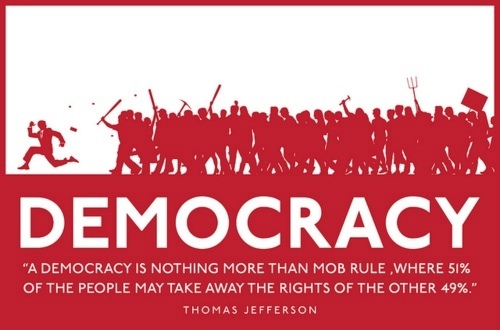 The mob can rule itself.